Trolling HBCU pride by any means necessary. In the social media world of 2018, few things are as tired as the HBCU vs. PWI debate. You’ve seen them on your Twitter timeline or Facebook feed and likely been pulled into one which can get ugly really fast. Don’t get us wrong, we love our HBCUs but at the end of the day the most important thing is getting a degree and a place that fits you as an individual. That being said, some folks just can’t let black folks being happy in black spaces enjoy themselves without trying to steal the show. Case-in-point, this “PWI Grad” tee that had the nerve to show itself up on Memorial Day. Of course, this is a play on the immensely popular “HBCU Grad” shirt created by North Carolina A&T alumnus Asaad Thorne a few years back. Besides being fashionable as hell, these shirts are popular because they resonate with the feeling of pride that comes with having attended (and hopefully graduated) from an institution that was made specifically for black folks who were shut out of majority institutions in the South and around the country. Despite various difference from large to small, private to public, and everything in between, these schools have a shared history of providing a place to learn when African-Americans were shut out pretty much everywhere else. PWIs (predominately white institutions), on the other hand, also have a shared history that identifies them. However, in 2018, it’s not something that they would like to promote. So why in the world would an alumnus of the university, a black one at that, parade that distinction around on a shirt? The answer is simple: Trolling. Trolling black folks who are proud of being a part of a special segment of higher education that served us when no others would. This brother might as well wear a shirt that says “proud graduate of a school that wouldn’t allow my grandparents to attend no matter how smart they were because of the color of their skin.” Sounds pretty dumb, right? Surely, someone will cape up for this and say the shirt is fine and that people are overreacting to someone having fun. I’m sure that Mercer University, the school listed on this gentleman’s shirt is proud that he brought attention to the university’s 130-year exclusion of African-Americans from matriculation. That spanned from the university’s founding until the day that Sam Oni walked through the doors and had to endure treatment so bad he vowed to “never return to Georgia again” after graduating in 1966 (he eventually reconciled with the school). You see, there are real live people who had to fight to get folks like the brother in this shirt into those colleges and universities, usually at the risk of their own lives. Their plight was honorable and their sacrifice commendable, but the fact that they had to do so a century after the slaves were freed is a shameful moment for the country as a whole and these institutions in particular. It’s America, and this gentleman does have freedom of speech. And so do those of us who think its as tasteless as Karen’s Potato Salad. 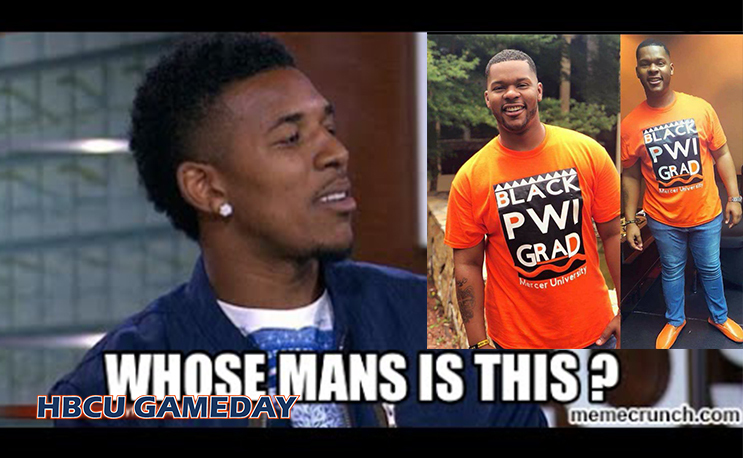 Wear your Mercer alumni shirt proud brother, but in the words of Michael Evans “don’t show your ignorance.” Plus, there’s always grad school at an HBCU if you just have to be in with the cool kids.